I thought this time I'd show my fool proof method for self facings. I assume other people know how to do this, but it was a revelation to me when I figured it out, so I thought I'd share. This is on a baby jean style jacket. Firstly, to cut the lining I just place all the pieces onto the fabric with seam allowances overlapped. The only shaped seam is the back yoke, so there I just have to fudge a little. (With lots of shaping, this obviously won't work!). My centre front section has a double folded self facing. You can see in this photo that I've pinned all of that back so the lining is cut to the front edge only. 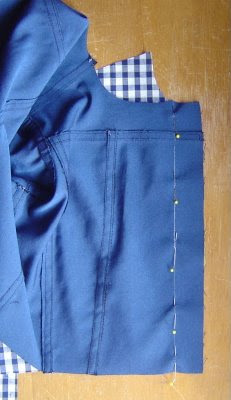 Next I line up the cut edges of jacket and lining, right sides together. You can see how much difference there is in necklines for the two pieces. I've chalked in my stitching line, which is precisely on the facing fold line. Then I sew this seam, and turn the jacket and lining right way round. When the facing is pressed it looks like this. 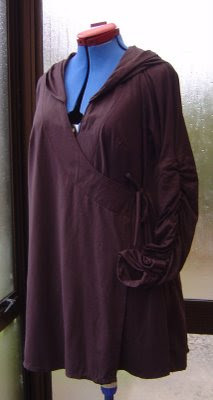 Necklines match up, and you have a layer of lining and two layers of self fabric to face/interface the centre front. Easy! After this (usually I've sewn the lining together before I do this, but it was easier to photograph before I sewed it up) I can easily sew the collar between jacket and lining, and the waistband over the bottom edge. This is the one drawback to being self-taught. It can take years before you figure out something as simple as this. Firstly, here is a close up of the label I made yesterday. As you can clearly see, I need to practice keeping it straight! I've been asked a few times about Glad Press'n'Seal. It has to be my all time favourite stabilizer! The "proper" ones are neither readily available, nor inexpensive in my neck of the woods. I can pick this up in the supermarket for a few bucks, and use it whenever I need a removable stabilizer. 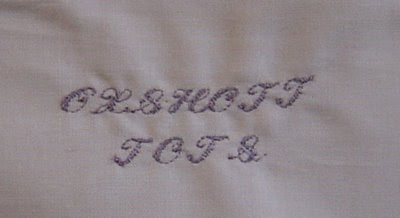 My favourite use is for marking designs to embroider. 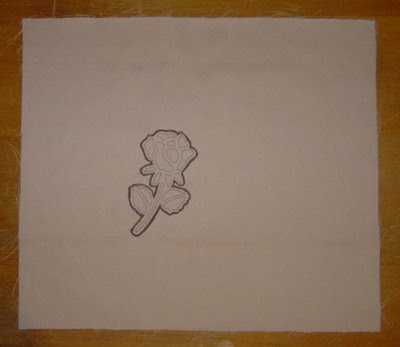 Here I've traced the stencil image onto paper because the sharpie marker bleeds if I use it with the stencil. The press'n'seal sticks to the paper, but doesn't leave any residue when you take it off. Here's the design, traced with a fine tipped sharpie marker. The sharpie works just fine if I don't use it directly with the stencil. 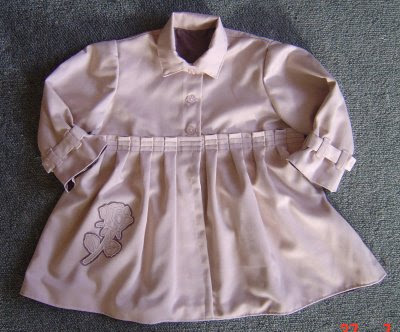 Once the ink is dry it's permanent, and doesn't rub off onto my sewing thread. 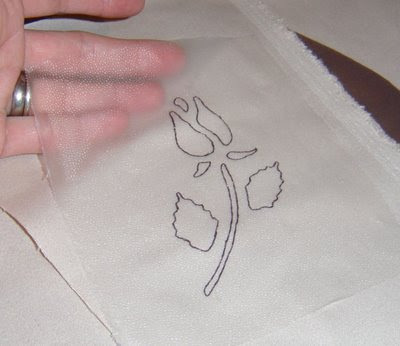 The press'n'seal sticks to the fabric nicely, but again leaves no residue when removed. After stitching around the design, you have to pull out the press'n'seal. In small areas that can be a pain, but good tweezers help. You can see it peeled back on the right petal, leaving no sign it was ever there. I really love this stuff. I have yet to use it for food. And here it is, all finished. Probably. 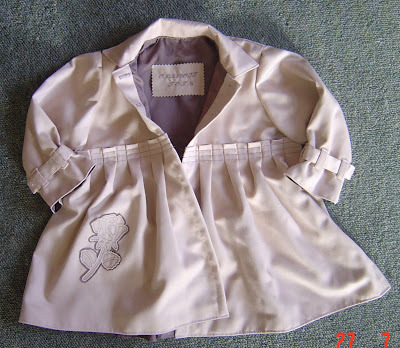 I've put the three buttons I originally envisioned on the bodice, and I think it's actually ok like this. Once I'd made the coat I was worried that it'd need a button or two on the skirt part, but I didn't have enough turned back facing to put in buttonholes. (I'll modify my pattern for that in future). After a lot of thought, (and consultation with friends) I decided that a trouser hook and eye at the pleats should do what was needed. So I dug one out and put on the buttons. Only to then decide that actually I'm not convinced that it needs the hook to help hold it nicely! So, provisionally finished. I'll try it on Isabella when she wakes up (and I have some extra hands to hold her still for a pic.) Then I'll decide! I went to visist a friend yesterday to play with her sewing machine. It does a lot of stitches, including three fonts of lettering, and she let me make some labels to sew into my own designs (I did bring the velvet coat I've been making for her, which might have helped!) I had a lovely time playing around, and after several samples came up with the one you can see in the coat below. It's not sewn in yet. Since I made the labels after the coat I'm going to have to hand sew it in, but in future I'll put them in during construction. I think I took a close up of it, so I'll put that in my next post. I decided on the name "Oxshott Tots". Oxshott is the name of the village (in England) where my mother grew up. The vibe of my designs sort of felt like an English village in the thirties (probably influenced by the old photos I've been scanning for Mum! ), so this appealed. I may change my mind. I often do. 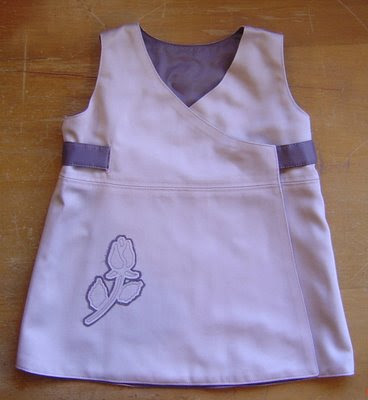 This is JAR #3, a pinafore I made to go with the coat. The idea for the design popped into my head while I was watching TV on Friday evening (Supernatural, anyone? ), and I had the dress drafted and made by Saturday afternoon. 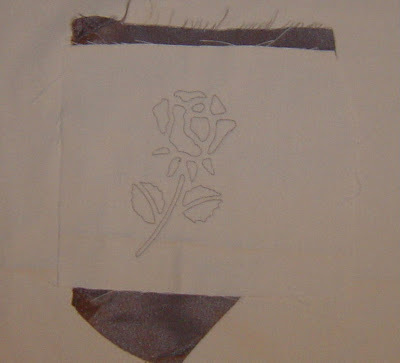 I was very pleased to be able to use the first block I drafted, for a bodice. I didn't use it for the jacket designs because even when it was altered appropriately it didn't work as I wanted. Nice to know I didn't waste my time drafting it! 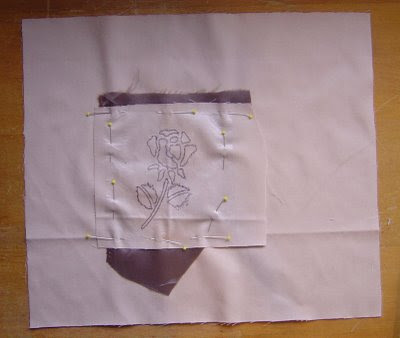 The rose design on the skirt is from the same stencil as the one on the coat, applied in the same way. Up next, a few behind the seams (sorry, pinched that) how-tos of some of my details. I'm almost done! Once again dodgy pictures, largely due to dodgy weather and lack of light. All I have left to do now are the buttons and buttonholes before a final press. I'm still pondering just exactly what I'll do with those. My first thought was just to put three buttons on the top section, but now I see it made I'm a bit worried that that won't be enough. Problem is that the skirt doesn't have a very wide facing (since I didn't plan to put buttons on it) and I'm not really sure whether it'll stand up to having buttonholes put in. Frog style buttons and loops might work better. As I said, still pondering. This equally dim pic shows the lining. The coat fabric is a mushroomy pink, very pale. The lining is mushroomy brown. They go really well together I think. I'd love to photograph it on Isabella when it's all done, but I have visions of her drooling, spitting up, having a leaky nappy........ we'll see! I've just started sewing my jean jacket prototype. That at least I can do in my sleep since I've made that style several times before. I managed to persuade Georgia to stand still for long enough to snap a pic of her new sweatshirt. This one is Jalie 2795 which I borrowed from Keely while she was too busy studying for her exams to be sewing. (It obviously worked - she got all A's or better as usual!) The unusual hood/collar combo on this really appealed to me. It is really cosy, and sits nice and flat when it's down. The shape of the sweatshirt suits Georgia too, so we have another winner! I've also been working on my own design, JAR #2. I decided that the skirt needed something to pep it up. Keely will tell you I'm rather fond of roses. 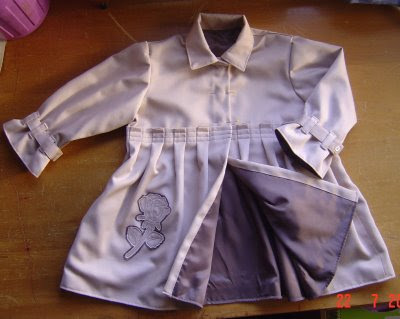 (OK, mildy obsessed with decorating items of clothing with them!). So for this one I tried a simple embroidery/applique combo. Pics are not good because I took them at night in dodgy light, but you can get the idea. 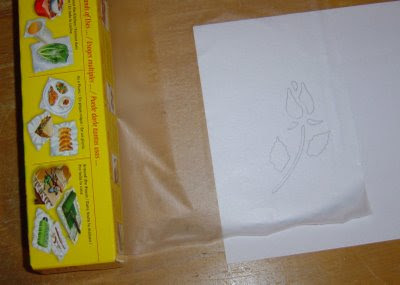 I got the rose image from a stencil I bought at Spotlight a couple of years ago. I traced it onto Glad press'n'seal with a fine tipped sharpie marker. 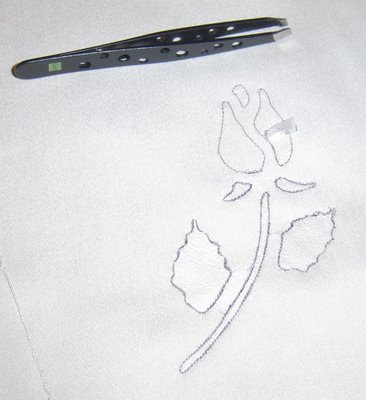 Once the ink is dry it's permanent and doesn't bleed onto the thread as you sew through it. I stuck the press'n'seal onto a scrap of the coat fabric, and layered that with a scrap of the lining fabric onto the coat skirt and pinned the layers together. On a limp or unstable fabric I'd baste it on, but this was fine with pins. 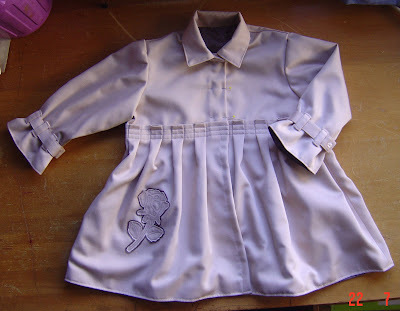 Then I sewed along the lines with my sewing machine, on a short stitch length. I wheeled by hand when it wasn't fairly straight. Which was a lot. I started and ended each section in the same place, and pulled the top threads through to the back before tying off the tails so there is no obvious start and stop on any section. Here it is after I've stitched it and pulled out the press'n'seal. And finally here it is after I'd trimmed each of the scrap pieces. The border of the lining really helps to pick the design out I think. I'm really pleased with it so far! Now I just need to get thread for my lining, cut the lining and sew the rest of the coat together. Monday I'll probably be working on a velvet coat for a friend, Tuesday will be working on my Dad's boat canopy (he's spending a week in Doubtful Sound in November and needs it for then. I am so jealous! ), so the coat might take most of the rest of the week to finish. Woohoo! New hard drive! I got the camera software installed PDQ so I could put photos onto the computer and edit them. Here's a selection of what I got up to while I was not blogging. This is Jalie 2682 , which I made for myself a couple of years ago in the sleeveless version. I always planned to make it for Georgia and finally got around to it a few days ago. I loved that we could decide at lunch time that I'd make if for her, and even including tracing her size it was done by 3pm! And I had to feed and change the twins in that time as well! I love the shape of this, especially the neck. Nice and warm for a winter T shirt. She loves it. I'm annoyed that I wasn't paying attention to lining up the print when I cut it out - doh! This will be revisited a number of times for both of us and Isabella I suspect! This is the best of a number of truly horrible photos of my new trousers. (Tip - never let a distracted nine year old be your photographer. Wait for your husband, who will at least get you in focus!) They're #101 from BWOF 05/09. I cut a size 42, but ended up taking them in enough that they're probably more like a 40. I also adjusted the legs by taking them in a little at the knee, then cutting straight to the hems to reduce the width of the lower legs. The magazine made them in satin, but in my heavy denim that was going to be too full. I should have shortened the front crotch length, but when I muslined them they were ok. If I'd sewn in a zip instead of holding them closed I'd have had a better idea though! However, I never ever wear tops tucked in, so it's not a big deal. The muffin I'm sporting in this pic is due to my top, (another Ottobre nursing top) not my actual muffin, which I'm happy to report is now 7kg smaller than it was a couple of months ago. Still no comment from the husband. And this is V1061, the Sandra Betzina wrap top. It's quite a dark colour, so hard to photograph. this is the best I could get. Here's the front. On me it sits more snugly to my front. And the back. The hood looks good, but in this rather slippery fabric it's inclined to slip down to cover my shoulders a bit. If it annoys me I'll take it off. You can't see the panel seams very well unfortunately. On me it sits a bit loosely at the back. I'm not sure if I was off in my seaming, or whether I should have gone down a size. I absolutely definitely need to adjust the bust point for my next version of this - no Wonderbra in the world can hoick my bustline up THAT high! I made for Georgia were no good because I took them in the conservatory with sun and shade obscuring a lot of the details. I'll have to try again. I've also been working on the design for the baby coat from my last post, and have a store in town willing to look at what I make with a view to stocking it! No promises, but I'm dead keen to produce something saleable now and see what they think. Fingers crossed. It finally occurred to me that I could probably put photos straight from my camera to my blog rather than onto the computer first, then blog. The downside to this is editing. I have photos of my Vogue top which are sideways, and consequently not going to make it here till I can turn them around. These ones could use a bit of cropping, but I can live with my wrist pincushion and sewing machine popping into view. This is the toile of my first attempt at a jacket block using the shirt block draft from Aldrich. I got a bit creative with some of the measurements, and I'm very pleased with how it turned out. This is for a size 80, and fits both Isabella and Nicholas as I want it to. Enough room, but not too much. Unfortunately neither was willing to pose for a photo! Unfortunately the photo isn't very sharp. 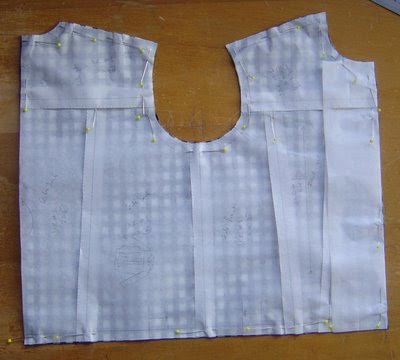 The skirt is applied onto the bodice with three rows of topstitching holding the external box pleats flat. The sleeves have belts threaded through belt loops, and will be held with a button. I may do a buttonhole and make it functional, or just a button for decoration. Or snaps. We'll see! The fabric was a b**ch to work with! I bought it long ago for goodness knows what reason. It's very thin, probably treated cotton. It has zero give, even on the bias, and Will Not Ease. Setting collar and sleeves was much harder than it should have been. It creases easily, but does not press well. I did say a few bad words over this! New hard drive this week - yippeeeeee!!!!!! !